Last edited by '87 750 RT on Thu Mar 10, 2016 8:10 pm, edited 1 time in total. Re: headlight to cage mount? The reason why the breakers sell the headlight assy. without mounting hardware is because it is not part of the headlight ! The headlights slot directly without any other part (except a large foam gasket that is figure 8 shaped for the headlight aperture) straight onto four plastic m8 studs with m6 metal threaded stud inserts that are part of the nosecone fairing. Then the nosecone c/w headlights fixes to the "birdcage" frame that supports the nosecone and instruments. There are rubber grommits in the birdcage mountings at each corner which the studs go through and then a flat washer and a m6 nut. The nuts are a "special" and exactly the same part no. as the exhaust manifold fixing nuts. Normal m6 nuts can be used as a replacement . If you are without a nosecone fairing I realise the above information would not be immediately apparent. The plastic studs are part of the nosecone and cannot be removed. M8 bolts may be substituted or m6 with a fabricated m8 external dia. spacer. thanks for taking the time to solve, should have known every manuf. does things different.couple other Q. 's/ the side fairing scoop ducts-where do the outlets attach or do they just point at the engine? and the nose fairing air tubes-where the right side attaches to the frame is the coolant hose-hardly any room for any air to enter.is this the correct attachment location? thanks. Cannot help with airduct location specifically; I do not have that machine. Usually on side scoops there are plastic deflectors that channel airflow towards the engine. 9 times out of 10 they are missing on a used/crashed bike and not replaced. The nosecone ones are over 75% for show. The small amount of air that is channelled via them, either just goes to the hollow frames and a small amount exits in the general vicinity of the airbox. No air should go to the hollow frame, this should be prevented by a rubber grommet and all the air from the air tubes should exit in the general vicinity of the airbox. Re: Fairing air intake pipes? Re: headlight to cage mount? + throttle cables. thanks for sorting the headlight issue.now can anyone advise how the air box installs? 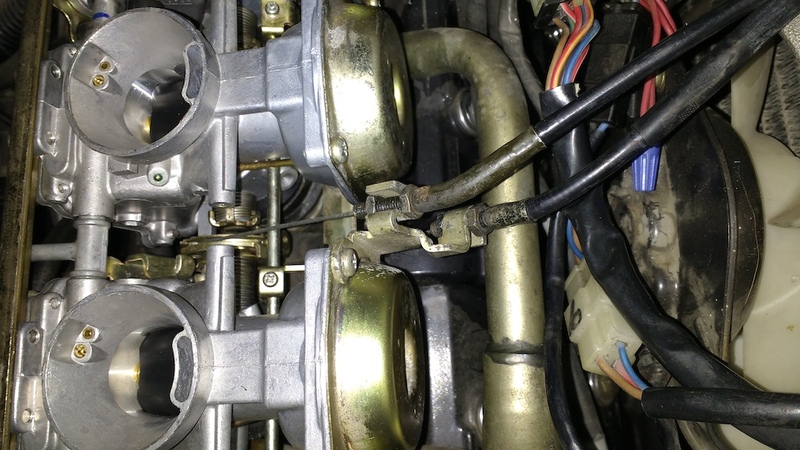 the 87's used a single throttle cable.since running a 1k engine Yamaha used a duel throttle cable setup.I have cable#2 in the rear slot of the mounting stop.but the airbox from a 1k engine will not seat completely on the carbs.seems to be limited by the #2 cable.anyone have a heads up to what I maybe doing wrong? thanks. ebay UK has more '87+ fzr's so more parts.this pic is from an 88 1000 & is the same as I have.maybe it just takes some fiddeling to make it sit correctly.thanks for the reply. update-measured the joint ID as 48mm/ the 1000 joints are 50mm.just ordered the correct joints( less curvature ends in the box) & will see how it goes.